Employees from TDS Telecom, Baja Broadband, and OneNeck IT Solutions (two companies also in the TDS family) continue to make strong community connections through their good works! From helping out local food pantries to getting soaked for a good cause, employees across the enterprise are doing what they can to help others. TDS Telecom associate manager of Field Marketing, Matt Ivens, shakes hands with Paul Terranova, the executive director of the Lussier Community Education Center (LCEC) in Madison, Wisconsin. 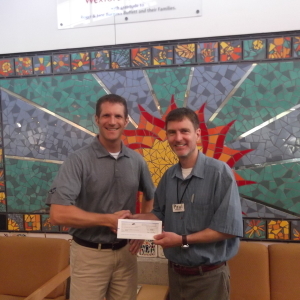 TDS donated $1,000 to their food pantry. The LCEC’s food pantry has been running for more than 25 years. The pantry provides an assortment of nutritionally balanced, non-perishable food items to individuals and families up to 12 times a year. TV’s, computers, printers, and much more were collected by volunteers in Hotchkiss, Colorado during a recent E-waste recycling event. TDS Telecom along with several other businesses and organizations helped sponsor the event. According to the area’s local paper, The North Fork Merchant Herald, between 10,000 and 12,000 pounds of e-waste was collected. Don’t believe your actions make a difference? Here’s proof that what you do matters. According to Baja Broadband’s coordinator of Marketing and Public Relations, Phyllis Duncan, this thank you note comes from the director at an organization known as CAPPED (Cancer, Awareness, Prevalence, Prevention, Early Detection). Baja runs Public Service Announcements for CAPPED on TV. The Director sent them this note to say thank you. He says the Public Service Announcements have gotten “at least 30 cancer patients or their family members” to walk through CAPPED’s doors looking for help!